I just came across a great deal on an analog delay. If you’re looking for a decent delay at a great price currently, check this out! This is the Akai Analog Delay. 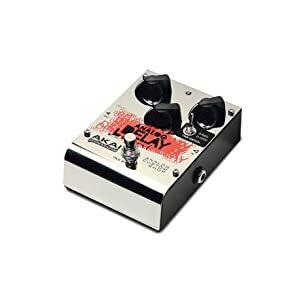 The Akai Analog Delay lists for $249.00 and is usually available for $150, but is currently on sale for only $71.14 at Amazon – that’s $78.86 off of the going rate. You have to admit.. that’s a great deal. The Akai Analog Delay also ships with FREE super saver shipping as well. The Akai Analog Delay is a true analog BBD design, and can have up to 1.1 seconds of delay. Sturdy metal chassis and vintage style chicken head knobs. Controls include a short and long mode delay switch, mix, time and repeat and also has a true bypass footswitch. Again, the Akai Analog Delay is on sale for only $71.14 at Amazon.com. At the time of this posting there were 13 units in stock. Usually, when stock numbers gets low the price may go up, so if you want this price, you’ll want to jump on this deal! Just got one for $54 + free shipping off Amazon. They must be closing it out?